He was born in Baku in 1940. He graduated in Architecture from the Azerbaijan Polytechnical Institute in 1963. He is the author of the books such as Architecture of Shusha (1977), Elturan (1986), In Architect’s View. 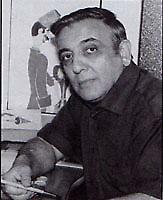 He was named as an Honoured Artist of the Azerbaijan Republic in 1991. He took part in over than 30 exhibitions. His solo exhibitions were held in Baku (1985, 1994,2005), Moscow (1986), Turkey (1999). He became a professor in 2003. He is a member of the Azerbaijan Artists Union from 2005. He is a member of the Azerbaijan Cartoonists Union from 2006. He is a member of the Azerbaijan group in FECO (International Federation of Cartoonist Organizations).